Last week we featured Albert Brooks as one of the great Jewish comedians. Today it's his father's turn. Albert's father, Harry Einstein (1904-1958) was known professionally by a multitude of pseudonyms, most commonly Parkyakarkus. He was an American comedian, writer, and character actor. 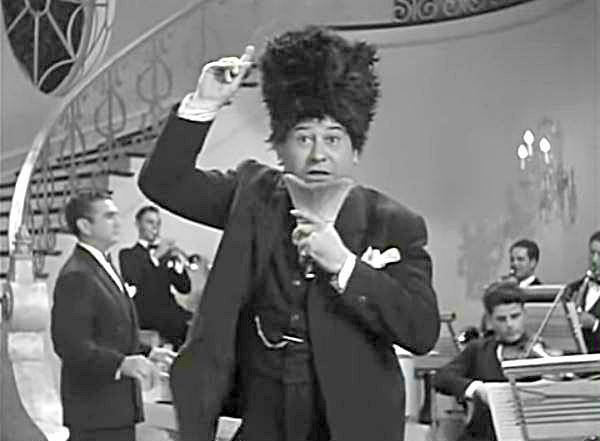 A specialist in Greek dialect comedy, he became famous as the Greek chef Nick Parkyakarkus on the Eddie Cantor and Al Jolson radio programs, and later on a program of his own. He appeared in eleven films as Parkyakarkas, or Parkyarkarkas, from 1936 to 1945. In 1944 (Yes, that was 72 years ago) he appeared in a wartime musical comedy, Sweethearts of the USA, also starring Una Merkel. The song You Can't Brush Off a Russian was written by Lew Pollack and Charles Newman.